Mate, what have you done. 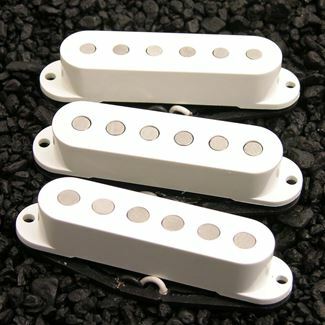 I bought these today and fitted them to my Strat this afternoon. I have only had these for a few short hours and in short these are amazing. I did not know that you could get so many tones. The tone pots actually do something now. The combination in this set of pickups have changed my world. I don't wright many reviews but these deserve one. Great tones from these bad boys. Brought my strat back to life. Neck drips with vintage goodness. Middle is nice and stratty. Bridge is throaty, screaming, and full of harmonics without being harsh. Can't go wrong!!! I always like to try before I buy, and since I happen to live close to RG's shop, I called and asked to come by to try a set. The staff was super accommodating and friendly. I even got a tour of the facility, which was icing on the cake. It was really cool to see all that goes in to making quality pickups. Do yourself a favor and upgrade your tone with these badass pickups made by great guys.